Who will be the first QB taken? 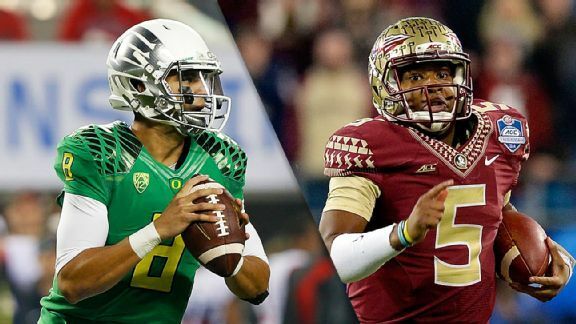 Will it be Oregon’s Marcus Mariota or will it be Florida State’s Jameis Winston? Now that the season and the All-Star games are in the books, I thought it would be a good time to do another top 5 ranking. It’s always interesting to go back after the season and see how many players that we thought were good had the type of season that would keep them in the top five rankings. This week I will start with the offensive players. Analysis: Let the debate begin. Winston or Mariota? Marcus Mariota won the Heisman Trophy and took his team to the title game, but I believe Winston is the closest to being NFL ready. Winston worked in a pro-style offense and is used to taking snaps under center. Mariota has more athleticism and in the right offense, may have the highest ceiling, but I believe Winston is closer to being ready to play right now. Garrett Grayson is riding a wave from the Senior Bowl. He had a very good week and was voted the best QB for the week of practices. Petty went to the Senior Bowl, but he struggled at times taking center snaps. Hundley has the physical tools, but needs to work on consistency and accuracy. Analysis: Todd Gurley is a 226 pound running back with speed. However, he is recovering from ACL surgery and may not be ready for the start of training camp. There may also be questions about his durability since he’s missed 10 games in the last two years. If he were healthy, I would have him as my top running back. Melvin Gordon has great acceleration and set an NCAA record with 408 rushing yards against Nebraska. Despite carrying the ball 343 times, Gordon averaged over 7.5 yards per carry. He also doesn’t have a lot of wear on his tires since he shared time with Montee Ball and James White his freshman and sophomore seasons. Abdullah isn’t a big guy, but he runs tough between the tackles and does everything well. He was the MVP of the Senior Bowl. The knock on him is his tendency to fumble. Duke Johnson is a similar back to Gordon. He is quick, fast and has the ability to make cuts at full speed. Coleman is an aggressive, powerful runner that not a lot of people know about since he played at Indiana, but you can bet NFL scouts know who he is. Analysis: Amari Cooper is head and shoulders above every other wide receiver in this draft. He has size, speed, quick acceleration and runs good routes. He should easily be the first receiver taken. DeVante Parker has good length, long arms and soft hands. His leaping ability makes him tough to defend on jump balls and he comes down with most balls within his reach. Could the Vikings have their eye on him to reunite him with Teddy Bridgwater? Kevin White is another receiver that excels on going up and getting the high balls. He was 3rd in the country with 109 catches for 1,447 yards and 10 TD. Jalen Strong is at his best when he can use his size to post up defenders. He also has the ability to accelerate quickly past a defender and stretch the field. Devin Smith may have the best game breaking ability of any receiver in this draft. He only had 33 receptions, but he averaged over 28 yards per catch and had 12 touchdowns. Analysis: Devin Funchess is a big 6’5” 230 pound physical specimen. Some analysts have him listed as a wide receiver. It will be interesting to see how fast he runs at the NFL Combine. Regardless, I think he is a player that will line up in the slot or outside and will not be much of an in-line blocker. O’Leary may be the most complete tight end in this draft class. He can line up anywhere you want him and is a good combination blocker/receiver. Maxx Williams has good size and can line up in-line or in the slot. He has the reputation for making tough catches and running with determination after the catch. Walford has great acceleration, but at times struggles with drops and is not a good blocker. He will be more of a force from the slot or outside. Jesse James has a huge frame and impressive catch radius. Analysis: Fowler and Neighbors are more of the classic NFL fullback. Both are devastating blockers, but Fowler also runs good patterns out of the backfield and has also contributed to the 4:00 offense, running time off the clock. Varga, Zenner and Zwinak were all running backs in college that could play either running back or fullback at the next level. Varga in particular made a name for himself in the Senior Bowl, by running with determination and catching the ball well. Analysis: Brandon Scherff is a dominating drive blocker in the running game. He also is a good technician in pass blocking. Peat has good length and long arms. He has a very strong lower body and is light on his feet. Clemmings has the athleticism you want in a left tackle, but only has two years of playing the position and is extremely raw. Flowers is a good run blocker, but he has a tendency to let speed rushers get inside of him. Ogbuehi has the build and athleticism you want in a left tackle, but he needs work on his technique. Analysis: La’el Collins was my # 5 offensive tackle in the pre-season rankings, but I believe he will be a better guard or possibly a right tackle. He has strong hands and when he gets a hold of a defender, the game is usually over with. Cann is a powerful guard with the movement skills to get outside on screens and sweeps. He is a very good run blocker, but needs some work in pass protection. Arie Kouandjio is following his brother Cyrus into the NFL. Arie is a dominating drive blocker, but struggled in pass protection until he was taught a quick set at the Senior Bowl. He looked much better after switching techniques. Laken Tomlinson improved his draft stock at the Senior Bowl. He held his ground with all the defensive linemen, including Washington defensive tackle Danny Shelton, who is expected to be a top 10 draft pick. Matias has good length and long arms. He has good footwork and has a good football IQ. Analysis: Cameron Erving spent most of his career at tackle and was my #4 ranked offensive tackle in the pre-season. However, near the end of the season, the Seminoles moved him to center and he played some of his best ball. I think he may have found his best position. Reese Dismukes has been the anchor for the Auburn Tigers and was a big part of their success under head coach Gus Malzahn. Hroniss Grasu is a bit undersized, but he battles well against bigger, stronger nose tackles. He has good feet and has the movement skills to pull on sweeps and screens. Andy Gallik has a nasty disposition and gets by more on his effort and scrappiness than with physical ability. B.J. Finney is a former walk-on that became a team captain. He is a former wrestler that plays with great leverage. If you like what you read, like us on Facebook and tell your friends. Next week we will be looking at the top 5 at each defensive position. See you next Wednesday! This entry was posted on February 4, 2015 by draftmaniacs in Top 5 at each position and tagged 2015 NFL draft, A.J. Cann, Amari Cooper, Ameer Abdullah, Andrus Peat, Andy Gallik, Arie Kouandjio, B.J. Finney, Ben Koyack, Brandon Scherff, Brett Hundley, Bryce Petty, Cameron Erving, Cedric Ogbuehi, Clive Walford, Connor Neighbors, DeVante Parker, Devin Funchess, Devin Smith, Duke Johnson, Ereck Flowers, Garrett Grayson, Gus Malzahn, Hroniss Grasu, Isaac Seumalo, Jaelen Strong, Jalston Fowler, Jameis Winston, Jesse James, Josue Matias, Kevin White, La'el Collins, Laken Tomlinson, Marcus Mariota, Maxx Williams, Melvin Gordon, Mike Davis, Mike Matthews, NFL, NFL Draft, Nick O'Leary, Rashad Greene, Reese Dismukes, Sean Mannion, T.J. Clemmings, T.J. Yeldon, Tevin Coleman, Todd Gurley, Tre Jackson, Ty Montgomery, Tyler Kroft, Tyler Varga, Vadal Alexander, Zach Zenner, Zach Zwinak.